A light blue interior, divided cleanly into two by a row of booths in the middle, welcomes you as you walk in. The music perplexes your ears for a while even if you are caught up with the latest pop music trends. An open bar counter crowns the walkway on one side. On the other side, a table well-lit by hanging lamps and surrounded by tall tools is the vanguard to a long row of smaller, more restaurant-like tables; and invites you to grab something to drink, sit down and chat. For the first 30 seconds when you are not accustomed to the new sight, you may try to decide whether it’s a hipster coffee bar or a fried chicken place, and then decide it can be a bit of both. This is the sight that welcomes you at the BB.Q Chicken, a Korean fried chicken place recently opened in Allston, at 182 Harvard Ave. If you have been to Super88 before, it is quite close. From my experience, BB.Q Chicken is ready to offer you something new with their signature olive oil fried chickens battered with an innovative collection of spices. I got to try three different dishes of chicken — Gangnam-style Wings, The Cheeslings, and Golden Olive Chicken, with sides of pickled radishes and vinegar-coleslaw. The most amazing part overall was of course also the biggest concern of any food lover at a fried chicken place — the chicken. All three dishes contained one of the juiciest chicken meat I have experienced at a fried chicken place. It was cooked thoroughly and came in both white and dark variants over the three dishes, and even a merciless critic like me couldn’t find much to complain about. The Gangnam-style wings, despite being cheesily named, were not the cheesiest (that was the Cheeslings). They were thinly coated with spices and chili and fried to a light brown perfection. If you are bothered by the appearance of chili in your chicken, you can remove it and completely forget about the spiciness. But, if you are someone like me, to whom spiciness is a synonym for life, you will love every single one of them. Even when we all know Gangnam-style wings will probably never be as popular as its namesake, I can always hope it will. The signature dish of BB.Q chicken, Golden Olive Chicken, is a must if you like a sense of dissonance between your sense of sight and taste. On the surface, it looks the same as any traditional fried chicken with a thick, golden-brown layer of crunchy batter. With the first bite, that illusion vanishes as you taste the lightness of olive oil welding the chicken with the fried batter. This good feeling may persist as long as you don’t have a surprise encounter with a lost clutter of spices in a bite as I did. The Cheeslings were the source of sweet-and-savory goodness in the bunch. I enjoy cheese in moderation, so the golden-yellow tenders fried in a cheesy batter was obviously not my favorite. But, if you are someone who enjoys the powdery simplicity of parmesan or the smooth texture of mozzarella, you might enjoy the combined texture over the juicy chicken that dominates the Cheeslings. None of the chicken dishes were as spicy as Bonchon’s spicy chicken, although that might have been because of my specific request. Instead, BB.Q Chicken offers a subtler sensation on the taste buds, which the use of olive oil might have hinted at earlier. 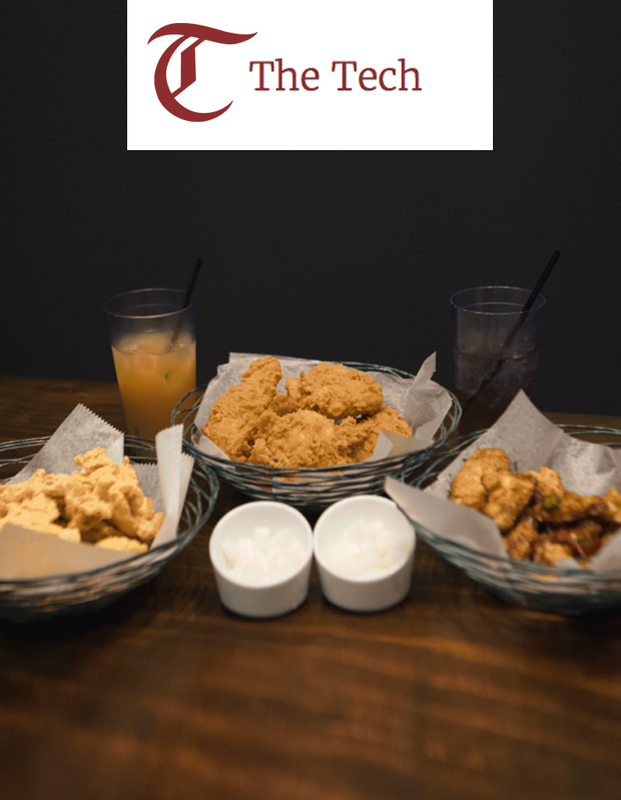 With a variety of seating arrangements, innovative offerings of fried chicken and a hospitable attitude, BB.Q chicken might be the next stop in your nights out if you’re open to new experiences.